What do you think is the number one, most essential camping item? Alright, so a tent is probably up there. Maybe a sleeping bag next. And almost always in third place will be a flashlight of some description. But do you know what’s better than a flashlight? 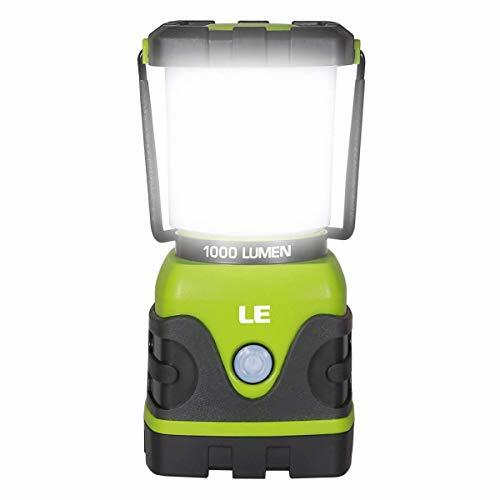 But when you’ve got to wait several hours for that to come around again, an essential piece of kit for any camping adventure is a good camping lantern. When you’re in the wilderness and the sun goes down, it can be quite alarming at just how dark it can get – and your portable, wind-up torch isn’t going to cut it. See if you can find the best camping lantern 2019 in this review, and a buyer’s guide and FAQ will follow to help you get clued up on what to look for. Do I Need to Replace LED Bulbs? Do LED Lanterns Come With Batteries? What Kind of Batteries do the Lanterns Take? 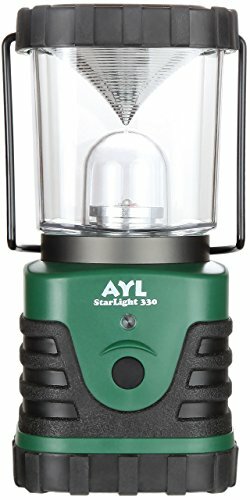 Will My LED Lantern Work in Freezing Conditions? How Long Will a Camping Lantern’s Light Last? Review: Available in a choice of colors and pack sizes, these bulb-shaped LED camping lights are great for hanging up around your tent, or wherever you happening to need some illumination. Each operated by three AAA batteries, they offer a dimmer switch to save power and are weather resistant. Surprisingly bright for the size. Not the most long-lasting lanterns out there. A terrific budget light with multiple – but short – uses. Review: In the style of an old, oil-wick hurricane lantern, this 12 LED, battery operated light offers 150 lumens of output. It requires 2 x D batteries (the fat, cylindrical ones), and it’s a visually beautiful option that would be great for decorating the home, or for more traditional/image conscious campers out there. Not very practical for camping. A beautiful, traditional-style lantern that will turn heads – but it’s not a heavy-duty option. Review: One of the best camping tent brands around, Coleman are the camper’s best friend. They’ll no doubt reappear on this list, but this is their basic and budget LED light that can last up to 175 hours. It takes 4 x D batteries and is water resistant and lightweight. A great back-up lantern if you’re on a budget. Review: A two-pack, super-bright lantern that you can collapse for portability or to adjust how much light you want the device to give off. 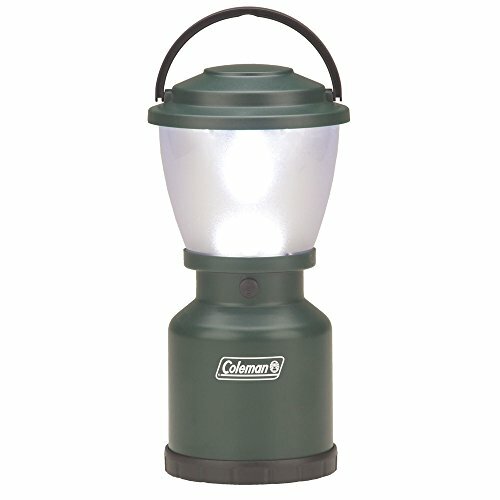 It’s an extremely popular choice and one of the most consistently top rated camping lanterns available. It takes 3 x AAA batteries to offer 360 degrees of light that turns on by extending its collapsible design. Super bright for the size. Might be too bright for some. Altogether an outstanding camping lantern pack considering what you pay. Review: Usefully offering four lighting modes, this lantern has the option to not blind everyone in your vicinity – including a warm shade that would work well as a night light. 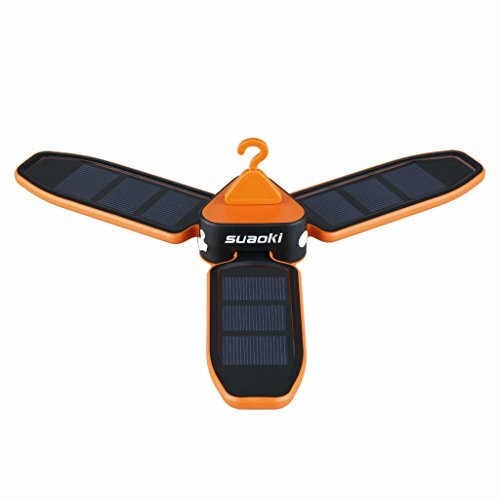 It takes 3 x D batteries which can reach a brightness of 1000 lumen if required. Altogether one of the best LED camping lanterns on the market, especially for the price. It was hard to find a fault. Review: Powered by a solar panel and/or USB, this collapsable, accordion-style design is incredibly portable. It flattens down to less than two inches thick – and can still be used as a flashlight in that position. It offers three lighting modes and will last five hours on a full charge at maximum brightness. Pops up like an instant tent! A brilliant little light that doesn’t need expensive batteries – it’s portability means it could well be the best lantern for backpacking around. Go for a dedicated solar power bank if that’s what you really need though. 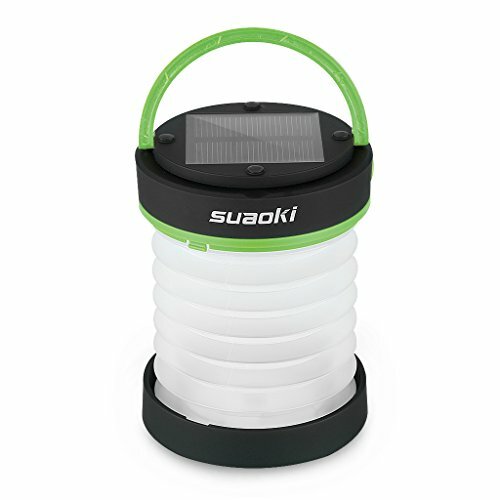 Review: A unique “clover-style” lantern offers a variety of positioning options, another Suaoki rechargeable and solar paneled device. Choose from three lighting modes, where it will last four hours on the low and two hours on the high settings. A hidden hook is useful for hanging the lantern anywhere you need a little light. 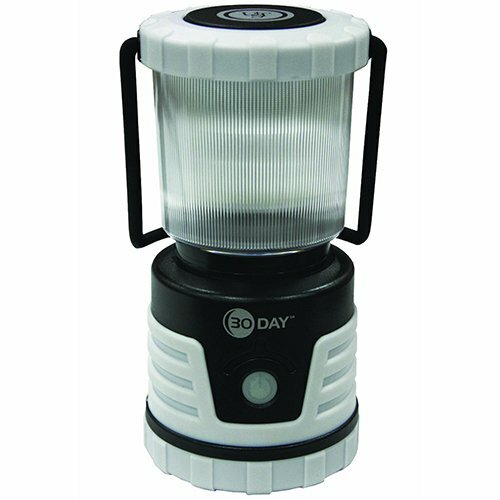 One of the best solar camping lanterns available. A great gadget with loads of potential positions and uses, but if you need something to withstand the elements it isn’t going to be for you. Review: Packing a whopping 600 lumens of light for its size, this has a shot at being the most powerful camping lantern on the market – especially considering the price, too. It takes 3 x D batteries and claims to last 6 days straight in a single use. 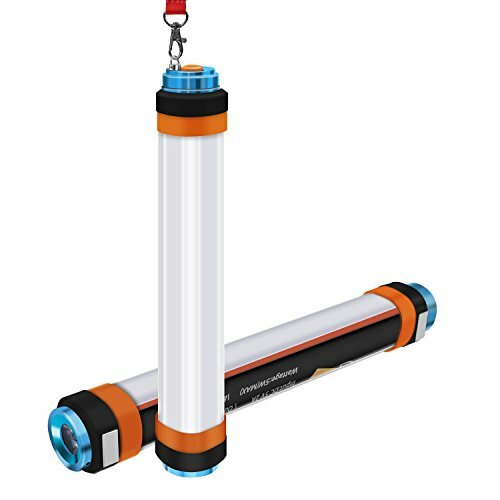 It’s shock and waterproof design is useful in a variety of situations and it even has a handy LED indicator light so you can find it in the dark. You can’t turn the indicator light off. A powerful, solid product that you’ll struggle to find fault with. 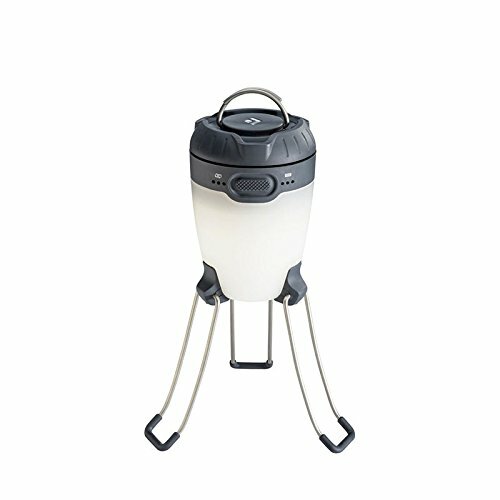 The best battery powered camping lantern for the price, easy. Review: The second of my Coleman choices and the only propane lantern on this list. 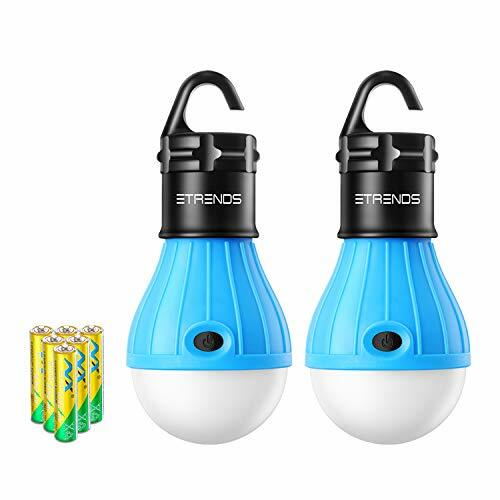 This uses a propane gas cylinder (sold separately) and lights with a match, giving up to 13 hours of continuous light with adjustable brightness. And at 967 lumens, it’s all the light you’re going to need. Gas lanterns won’t be for everyone. Another quality Coleman entry, but using and replacing gas canisters will be off putting for more casual campers. Review: A super long-lasting lantern, UST claim that this durable design will give you an incredible 30-days of continuous light on a low setting, and 22 hours on high. It has a removable globe so you can focus the light in one direction and it runs on 3 x D batteries. Glo-White model glows in the dark to help locate it. 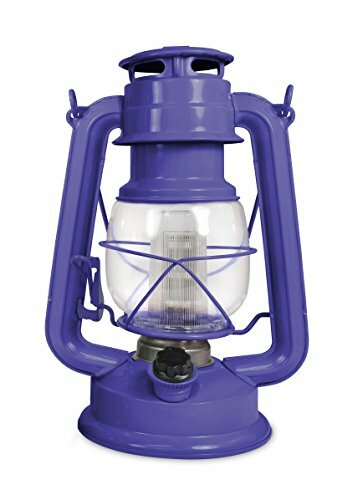 Another excellent camping lantern with loads of uses, but especially efficient during storms and power outages because of its long life. 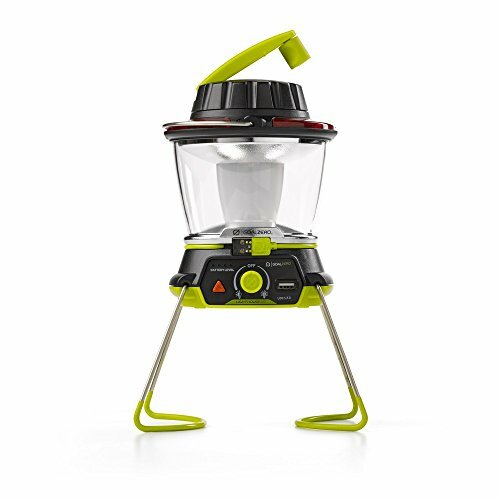 Review: There’s a lot to like about this rechargeable camping lantern as if offers a wealth of features. A strip light design, it has built-in magnets and hanging hook to assist in placement, which means it’s useful in a variety of situations and environments. It’s also a mosquito repellent light and is IP68 waterproof – which means it will withstand being submerged up to 10 meters. 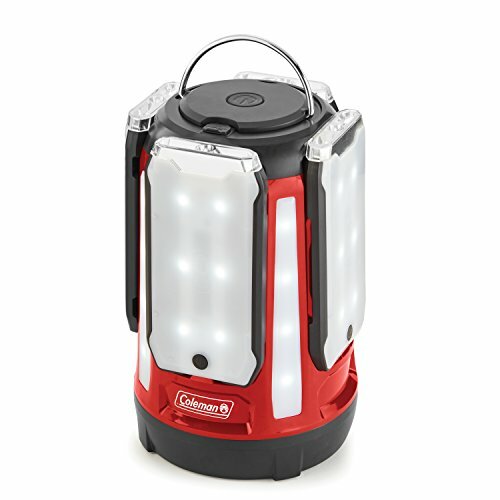 One of the best rechargeable camping lanterns, not least because of all the features it manages to pack in. Review: This is a solidly built lantern that’s as tough as they come while offering up to 30 hours of light on the highest setting. It takes 3 x D batteries in its rugged frame, with a choice of red or white LED lights depending on your needs. It’s built by outdoor enthusiasts for outdoor enthusiasts and has been tested to the most stringent requirements. This baby will even float if it has to. Red light option is really useful. Built-in ‘D’ rings are handy. At a push – it’s getting more expensive. You get what you pay for though. I’m seriously leaning towards this option as my choice. 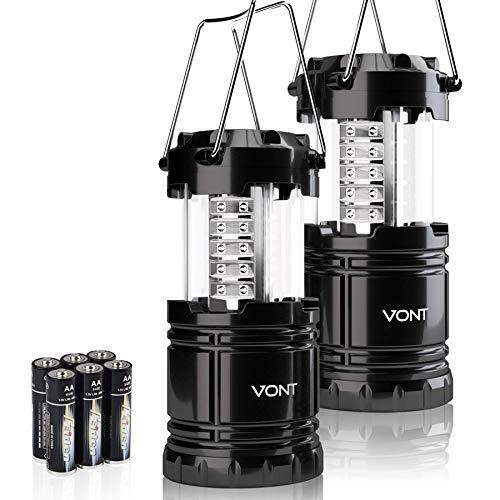 Definitely up there with the best LED camping lanterns on the market, and a good shout for the number one spot. Review: Colemans are at it again with this twin LED model which can offer up to 85 hours light at high power – more than enough for a weekend camping trip. It’s super easy to use with its dimmer switch – which is often preferable to pushing a button in sequence to find the right mode. It’s weather resistant and powered by 8 x D cell batteries. Dimmer switch is a real plus. Eight D cell batteries is pretty crazy. 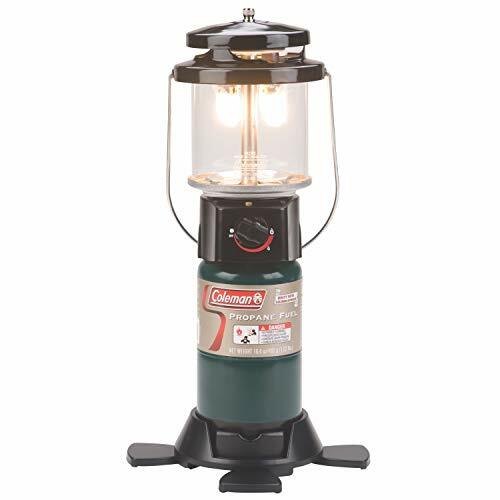 A very attractive, well built, classic looking camping lantern that offers a powerful range of light through the brilliant dimmer switch. It’s size ensures it’s not the best backpacking lantern 2019 though, that’s for sure! Review: Looking not too dissimilar to an alien spacecraft when set up, this tripod design is rechargeable and offers multiple lighting positions. It’s super compact when folded down too, yet it really packs a punch when it comes to its anti-glare lighting ability. You can also use 3 x AA batteries in the unit if you run out of charge. Holding the button adjusts brightness. A little on the expensive side compared to other, similar models. Not the most weather resistant. A wonderfully portable effort from Black Diamond and one of the best rechargeable camping lanterns available. 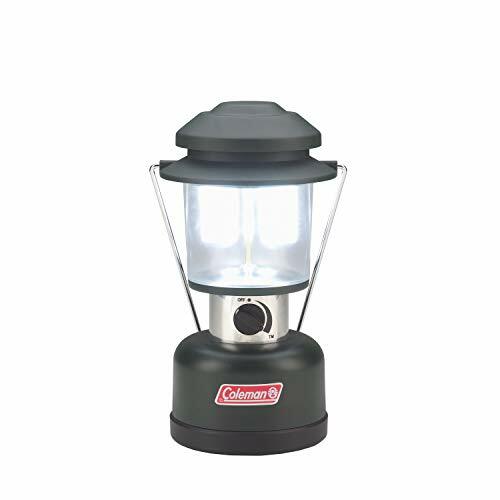 Review: Another lantern for those who prefer fuel over LEDs, this Coleman entry can use either the manufacturers own liquid fuel or unleaded gasoline. It operates in all weather conditions and has a dimmer knob to adjust to your preferred level of brightness. Bit of a hassle to turn on. If you prefer the more traditional, fuel lanterns, this is an excellent pick. Steer clear if you’re at all timid about flames or if you’re going to have children running amok. Review: This funky little design could well be the best lantern for camping due to all the features it offers. Rechargeable LEDs offer light at up to 400 lumens, with the ever-handy adjustable dimmer switch a real selling point. The power bank is handy for charging your phone in an emergency, as are the red flashing warning lights you will hopefully never need. Hand crank should it run out of charge. Powerful 4,400mAh battery power bank. Bad weather might cause it some problems. Connected this to a solar panel and you’ve got one of the best solar camping lanterns around. It’s best used only in good conditions though. 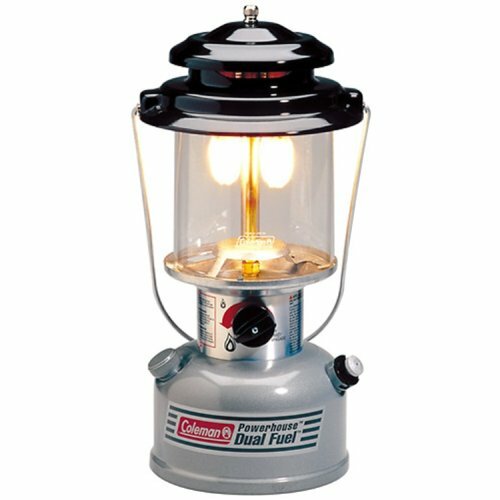 Review: There’s so much to notice about this Coleman camping lantern it’s hard to know where to begin. Four, magnetic LED panels attach to the main body and each can be removed and distributed as you see fit. It’s basically like having four lanterns in one. They recharge when docked and the base is powered by 8 x D batteries. It’s splash resistant with a USB charger for your phone. Four magnetic panels with built in stand. Three hours light from each fully-charged panel. Individual controls on each panel. A multi-use lantern that would be brilliant in emergencies – so long as you keep plenty of D batteries handy. Camping lanterns come with a lot of questions, especially if you’re new to the market. Here’s what you should be looking for and considering if you’re on the hunt for some light in your life. As with most products, before you buy you should be thinking seriously about what its primary use is going to be. A product for use in an emergency will likely be different from a regular camping lantern. Do you need long-term light or will just a few hours suffice? Likewise, frontcountry and backcountry camping lanterns are going to differ – mainly with variables like portability, weatherproofing and battery life. Maybe you’re looking for a jack-of-all-trades that covers everything? Either way, make sure you get something that suits what you’re using it for, and you’re not paying for anything superfluous just for the sake of it. I’ve covered the best LED camping lanterns in my review here, but I’ve also thrown in some fuel only models just to mix it up a bit. Again, the type of lantern you should be considering will depend on what you’re going to need it for. Fuel lanterns typically burn with a softer, warmer glow, will last an age both with light and the quality of the lantern itself, and are easy enough to refill. It’s not particularly advisable to use them inside a tent, however, or if you have little ones running around as accidents can happen. Some people aren’t comfortable with using fuel or fire either, and you’ll need ample ventilation during operation. LED lanterns can be blindingly bright, and generally safer than fuel versions. However, replacement batteries can cost you a small fortune and are likely to be not as long-lasting. Using rechargeable batteries might be an answer – but they don’t always have as much strength. Lanterns that have a recharge feature built in are great for reuse – just so long as they’ve been given enough charge. There’s not much you can do if it gives out the first night of your 2-week backpacking adventure in the middle of nowhere. Then there’s solar power – which is a nice idea for emergencies, but it shouldn’t be relied on and only used as a backup. A very important consideration in choosing a lantern is how bright is it actually going to be. You’ll notice that almost every product likes to mention the lumen scale. A lumen is a unit of luminous flux. A measurement of the quality of light emitted by a specific source. The higher the lumen number, the brighter the light will be. When deciding what lantern you should purchase, it’s worth considering that the brightest isn’t always the best. Especially if you’re sharing a tent and you wake everyone up in the middle of the night with the power of the sun. Again, factor in where it’s going to be used and what it’s going to be used for. A keychain flashlight is 5 lumens. A car headlight is 1000. Remember that when sneakily reading under the covers when it’s past your bedtime. A lanterns size and weight will fall into this category, so to the design and shape. Backpackers, hikers and climbers will be on the hunt for smaller, lightweight models – perhaps those that are collapsible. It’s ideal that they don’t take up too much space in your backpack. Vehicle campers aren’t too concerned with this and are likely to go for larger, heavier models that have more power. Just for the sake of the creature comfort. And for emergency lighting in storms or other situations at home, a lantern will often be required to remain in a fixed position, so it doesn’t matter if it can fit in your pocket or not. Also, consider the power source. Are you going to need to pack spare batteries, extra fuel or gas canisters? All of these items will take up precious space if you’re out adventuring. Another important thing to consider is how well do you need your lantern to stand up to the elements – and is your chosen model capable of doing so? Gas or fuel lanterns are built to last a lifetime – but they can also have a glass or fragile parts and not be particularly watertight. Dropping them from any height is likely to result in breakages. Heavy-duty lanterns with a solid, plastic/rubberized construction are more likely to survive rugged wear and tear. I’ll always recommend shockproof options to those who have a history of things slipping out of hands. Solar powered lanterns or those with power banks/USB chargers aren’t going to take kindly to getting a soaking. You should check the “IP” rating of the product if you intend regular use in the great outdoors. “IP” stands for “Ingress Protection” and it consists of two numbers. The first number is how likely dust and dirt will get into the product. The second number is how waterproof it is. ‘X’ indicates a product not tested under those conditions. You can consult an IP chart to figure out what it all means, but generally speaking, the higher the number, the more solid and durable the product will be. While you’ll probably never need to submerge a camping lantern, it might be nice to know that it will withstand torrential rain if and when it occurs. You’ll notice that all these camping lanterns have varying degrees of difficulty when it comes to use. Some will just turn on at the touch of a button. Others you need to fill with fuel, prime and light with a match. Many might be fiddly to get working at all. For light adjustment, is there a dimmer switch (awesome) or do you have to press a button in sequence (not so awesome)? Trying to gain access to the battery compartment might be comparable to completing a Mensa IQ test. Just some of the many things to look out for when making your purchase. As ever, you get what you pay for. Some lanterns are budget friendly while others are exorbitantly expensive. Don’t just throw money at something because it’s pricey – you might be able to get a cheaper model that will do the job just as well. But you know I always say to buy the best you can afford – because it will serve you well in the long run. It depends on the product and manufacturer whether or not you actually can. LED bulbs will give out eventually, but this is usually after thousands of hours of use. You might be able to replace them beforehand should they malfunction or break in some way – but again, this would depend on the manufacturer. If an LED does pack in on your model, it would be best to contact them directly. If you’ve used an LED product for that length of time you’ll replace it with a new one anyway. Most LED lanterns will specify how many hours their bulbs will last – but don’t worry – they’re not going to give out anytime soon. In short, no. You have to provide these yourself unless otherwise stated. In all my reviews here, none of the lanterns were offered with batteries included. It depends on the lantern, but most will take a number of either AA, AAA, or D type batteries. My advice is that you have rechargeable battery docks for all three in the home – you never know when they’ll come in handy for anything. Here’s where you need to use a little common sense. Camping lanterns are safe, just so long as you treat them according to the manufacturer’s instructions. As previously mentioned, it’s not a good idea to have a gas or liquid fuel lantern inside a tent or other closed environment. I wouldn’t leave a powerful LED wrapped up in any kind of bedding, either. Don’t mistreat the product in any way and everything should be fine. A very good question. Battery LED lanterns will be all but silent, gas lanterns will be considerably noisier. There is a strong chance it won’t. Battery and LED lanterns tend not to perform so well in extremities – both hot and cold. This is undoubtedly the main advantage of fuel versions – they’ll work whatever the universe throws at them and in all weather conditions. Again, it depends on the type of lantern. Make sure you thoroughly check the specs before purchasing. Well, I hope that has illuminated things a little for you and that you’re on your way to choosing the best camping lantern 2019. With such an impressive selection out there, I’m always curious to know who has chosen what – so do let me know in the comments below. Maybe I’ll copy you and buy that one myself, but my current favorite is the Streamlight Siege. Man, doing these reviews sure just makes me want to get out there and camp!